Trading to Win - Stock Market Views and Trading Ideas based on the mix of Technical Analysis and "Funny-mentals" by DavidDT using Tom DeMark Indicators Trading to Win: "It could be worse - it could be raining"
Whenever I feel stressed I watch my favorite old comedies - no obscure language, no blood, no guns, no "Idiosyncrasy". 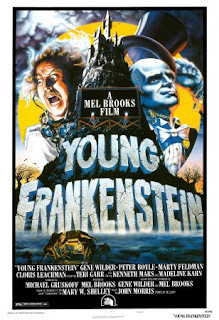 As you figured Mel Brook's "Young Frankenstein" was on my list today. Last few days action looks really interesting. Wednesday's and Thursday's huge volume did not break Dec/Feb lower trendline ( at least, not by much ). Friday in horrific ( especially for financial ) tape - it was up. I opened seed position (FRE) Mar30 calls on Friday - might add Monday. I'm reading: "It could be worse - it could be raining" $$Tweet this!